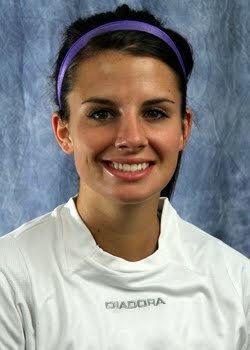 Coach Krystyn Cimino comes from a long-time Phoenix soccer family. She and her three sisters and one brother grew up in the Valley of the Sun playing soccer for local clubs including Paradise Valley Soccer Club, SC del Sol and AZFC. Krystyn attendend Northern Arizona University for a year, then went on to play a season for Paradise Valley Community College, and finished her college career at Bellevue University in Nebraska. During her senior year, Krystyn was named captain and her team made school history as the first women's soccer team to make it to the National tournament! They ended the year in the top 25 women's teams in the U.S.
Coach Krystyn graduated in the summer of 2011 with a Bachelors Degree in Business Administration with an emphasis in management. She worked and lived In Omaha for about 5 years where she met her fiancé. They moved back to Phoenix in November 2011 and we are very happy she joined our staff in the Spring of 2012!